Despite Iran’s apparent compliance with the nuclear deal concluded in 2015, its missile programs remain a serious concern. Since 2006, the United Nations has repeatedly sanctioned Iran’s ballistic missile programs, and in 2010 the Security Council called for a complete halt to Iran’s testing of WMD-capable missiles. The pace of Iran’s missile testing has nevertheless remained roughly steady since the election of President Mahmoud Ahmadinejad in 2005. One exception to this trend was a brief hiatus in 2013-2014 during negotiations over Iran’s nuclear program that led to the Joint Comprehensive Plan of Action. Iran has since resumed its missile testing, which now approaches previous levels. In July 2017, Iran employed ballistic missiles against ISIS targets in Syria. Another notable development has been Iran’s increased use of solid fuel, showcased by its medium-range Sejjil ballistic missile, and the short-range Fateh family, which includes the Zolfaghar and Khalij Fars. Solid-fueled missiles are more mobile and require less preparation time prior to launch than motors using liquid fuel. Besides its short and medium-range ballistic missiles, Iran has an active cruise missile program, which include the longer-range land-attack Soumar and several antiship missiles. Tehran also maintains an active space launch vehicle program, including the Simorgh and Safir, with which it can demonstrate technologies applicable to longer-range missiles. 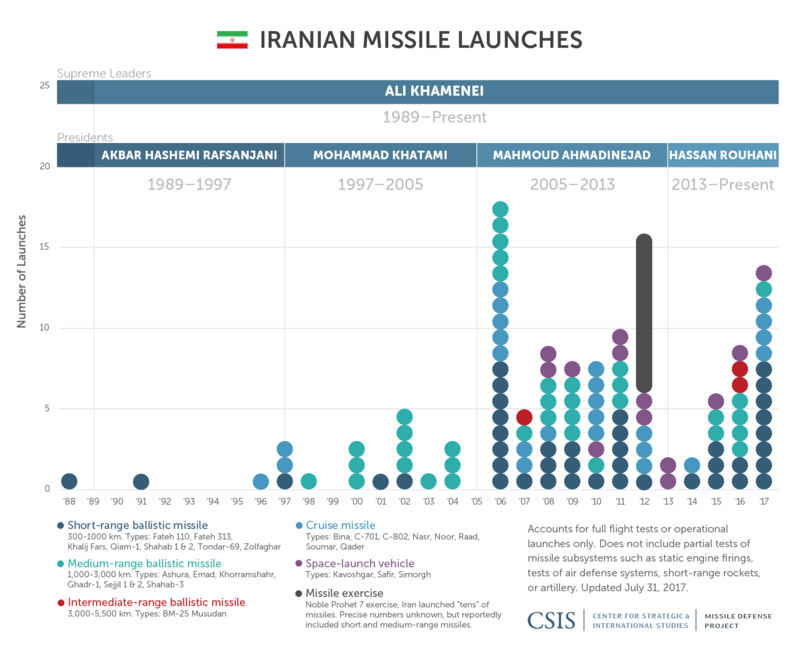 Missile Defense Project, "Iranian Missile Launches: 1988-Present," Missile Threat, Center for Strategic and International Studies, July 27, 2017, last modified February 25, 2019, https://missilethreat.csis.org/iranian-missile-launches-1988-present/.